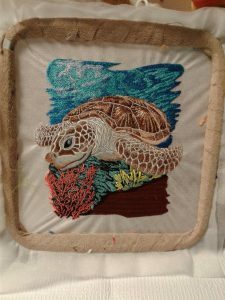 Marge has been doing her embroidery this way for quite some time and she is sharing her method with all of us! *Adding embroidery to any item makes it more beautiful. But if you are like me how many times has the placement been wrong or a little off? 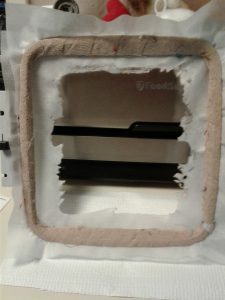 Embroidery is very hard to remove and even if you do on some fabrics it leaves unsightly holes. I do ALL embroidery that goes on clothing on nylon mesh. It doesn’t matter whether a small stitch count or very large. Any design under 60,000 stitches goes on ONE sheet of mesh, over that I use two. I know what you are thinking, it used to be 1 sheet for every 10,000 stitches. 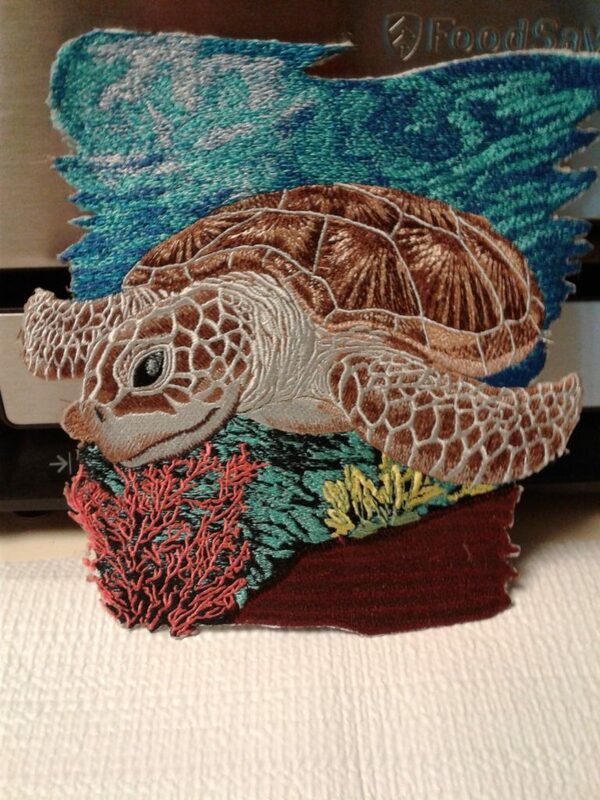 The turtle I am featuring here has 167,000 stitches, would you use 16 sheets of cutaway? I did it on 2 sheets of nylon mesh. After the design finishes you just appliqué it where you want it. It never is crooked or has any puckering. As you can see the turtle does have some puckering, now this would not be very pretty on a shirt but after removing no puckering. When doing tee shirts or baby onsies this is the way to go. With the onsies or and kids chlothing I put a card in saying that when he/she doesn’t use it anymore the embroidery can be removed and put on something else. I hoop one or 2 layers of mesh and proceed with the design right ON the mesh. When it finishes stitching out I use a stencil burner or if you don’t have one you can cut is out with a sharp pair of scissors. I leave the design in the hoop till I remove it, it is much easier to do it this way. If you have any further question or comments please let me know. I like the idea of embroidering on the mesh but what is the mesh? Could you please explain about what the mesh actually is. Thankyou. Jeannette. Marge what a great idea. How do you apply to the garment – hand sew or iron on adhesive? This idea just opened up a lot of ideas like taking the turtle and using double sided foam dots on the back and applying on top of colored poster board and then framing. I bet that would really give it a 3 dimensional look. Time to play…..thanks.